Contrary to reports in many media outlets, an IndexCreditCards.com survey of the seven largest credit card issuers found that none is doubling credit card minimum payments. In fact, most are adhering strictly to new federal guidelines or believe that their current minimum payment formulas are adequate to satisfy the government's desire to see credit card balances paid in a reasonable amount of time. Guidance from the government's Office of the Comptroller of the Currency suggested that card issuers should require their customers to pay monthly at least one percent of their principal credit card balances, plus all finance charges and any fees. The goal was to get balances paid down--under the previous industry standard two percent minimum payment, customers with high balances could conceivably "meet the minimum" without even paying off a full month's interest, much less taking a chunk out of the principal balance. Four of the top issuers are strictly adhering to the new guidelines of one percent of the principal balance, plus interest and fees. Two issuers are making no changes, due to long-standing minimum payment policies that the companies feel already address the government's concerns. One issuer has thus far made no change to their minimum payment policy of 2% of the credit card balance. "In mid-December we reported that claims of minimum payments doubling were not accurate; now we have the proof," said Adam Jusko, Research Director for IndexCreditCards.com. "Most credit card issuers are adhering to exactly what the government suggested or are sticking with minimum payments already above those guidelines. 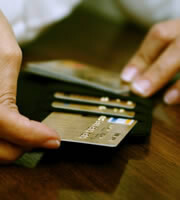 While some customers will see increased credit card minimums, the impact will be slight--certainly not a doubling." By way of example, a person with a $10,000 credit card debt and a 19% annual interest rate would have a required monthly payment of approximately $203.16 using the old 2% minimum payment standard. Under the new requirements that most issuers are using, the monthly payment would be $258.33 ($158.33 in interest, plus $100 of the outstanding balance). This is a difference of roughly $55 - on a balance and interest rate that exceeds what the average consumer is carrying. American Express - No change in minimum payment formula. To calculate minimum payments, American Express first takes the highest of the following figures: 2% of the outstanding balance, or all current finance charges, or $15. (If current finance charges is the highest of these three figures, the company uses finance charges plus $15 as the first part of the minimum payment equation. This usually ensures that part of the principal is paid.) The company then adds any past due amounts and any over-the-limit fees to come up with that month's minimum payment. Bank of America - Minimum payments equal 1% of the principal balance, plus all current finance charges, plus fees such as late payment or over-the-limit fees. Capital One - No minimum payment changes. Company uses 3% of the overall balance, or $15, whichever is greater, as the monthly minimum payment. Chase - Minimum payment equals the higher of these figures: either 2% of the outstanding balance, or 1% of principal plus finance charges plus fees. Citibank - Minimum payments equal 1% of the principal balance, plus all current finance charges, plus fees such as late payment or over-the-limit fees. Discover - No minimum payment changes at present. Minimum payment equals 2% of the outstanding balance. A company spokesperson declined to say whether Discover will make changes to this standard in the future. 0 Responses to "Survey Finds Largest Credit Card Issuers Not Doubling Minimum Payments"